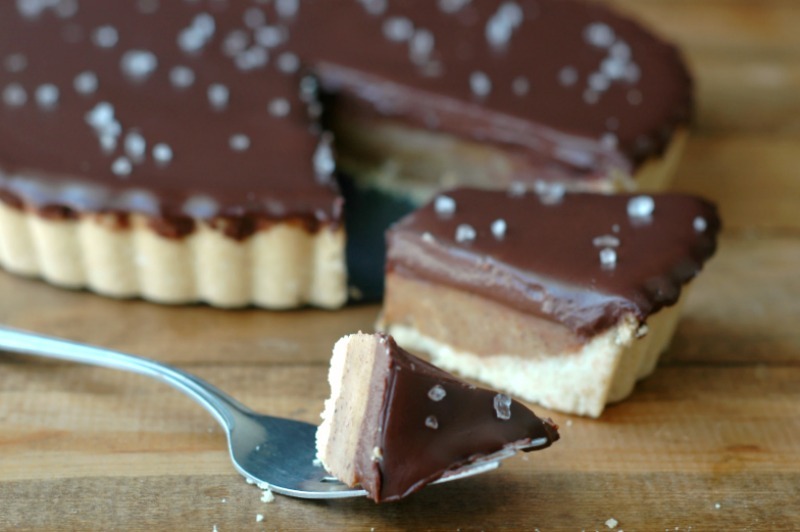 This easy prep chocolate nut butter tart is rich and decadent using all real food ingredients! Every once and a while, it gets to me. The winter. It’s so long here, and while I truly do love the 4 seasons of living in Michigan, getting through the winter “blah’s” takes some practice. First, I’ve learned this is not the time of year for crash diets. Eating real, nourishing, nutrient dense food not only keeps my body from getting sick, it also keeps my brain from being starved and going crazy while we wait for a little sunshine. I wait for that sunshine energy to fuel any spring cleansing, and save winter time for enjoying rest and fueling. Second, I’ve learned to have a little grace. I’ve found that when I allow my body to rest a bit more during the winter, spring and summer can run at full force, loaded with energy. There’s a season for everything. And during a season of rest, it is totally cool to settle in with a cup of coffee and a slice of your favorite treat. Food was meant to be enjoyed. It was meant to nourish your soul, not just your stomach. 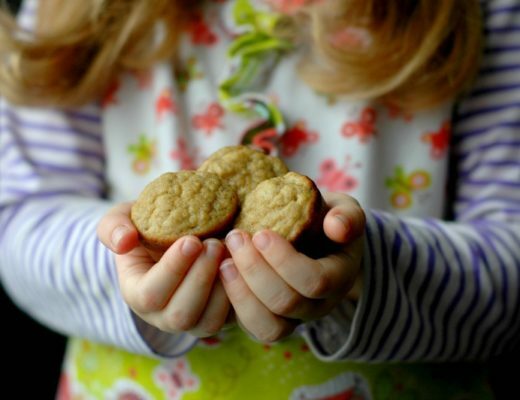 And while we enjoy every nourishing meal to the fullest every day, putting some love into a special treat to share with your family can nourish your sense of joy even on the darkest winter day. Of course, you can make these treats with real ingredients too! I won’t pretend that a little maple syrup isn’t still sugar. Sugar is still sugar. It isn’t something we have every day. But a special Valentine’ Day treat was definitely in the cards for us this year, and we used some simple real food ingredients to create a decadent treat that filled us with joy, and didn’t leave our tummies feeling crummy because of processed ingredients. Because this momma doesn’t have time for that! And while we’re on that note, I’m also not a baker. Those of you who have been around long enough know that baking is just not my thing. This chocolate nut butter tart may have pretty layers, but it is anything but finicky to work with. The crust will take you about 10 minutes to prep, and the other 2 layers will be 5 minutes or less! Promise that even my non baker readers are going to love this one! Originally, this recipe started out in one of my pie plates. 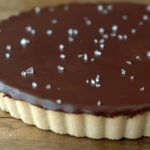 I made it half dozen times since then, until I found a tart pan on sale last month 😉 I love the presentation that the tart pan gives, so that is how I’ve prepared it for this post (and the removable bottom makes the presentation SO much easier!). That said, the recipe below is based on my pie plates, and I had some crust leftover when I made it in the tart pan. So the recipe fits in a pie plate if that is what you have, or if you happen to have a tart pan, just know that you will only use about ¾ of the crust. I also had some chocolate left (which made for really yummy chocolate dipped strawberries for Valentine’s day!). I think mini tarts in muffin tin or mini tart pan would be adorable too! Let’s start with the crust. You really can use any crust recipe. This crust is nutty, and sweet, and goes so well with the chocolate nut butter flavors. I have not tried other ingredient swaps for this crust, so you’ll have to play around with that yourself. If you really can’t have the nuts, or another ingredient in the crust, here is my gluten free crust recipe you can use instead. For the nut butter filling, I do think that sunflower seed butter would swap for the nut butter if there is a nut allergy. Sunflower seed butter always tastes like peanut butter to me anyway, so I think it would work! Deep breath momma. Winter with littles can feel closed in. Bundle the babes up, stick them in the snow for a few minutes, and then have some grace. Come on back inside, settle them with some toys, and warm up with your favorite hot cup and a slice of some chocolate nut butter tart. We’ll make it to spring soon! Cheers! ¼ cup avocado oil melted coconut oil should work too. If you tolerate butter, melted butter would work. 10 oz bag of your favorite chocolate chips Just watch those ingredients! If you are truly dairy free, Enjoy Life is a good dairy free brand. Put the flours, coconut shreds, and sea salt in a food processor and pulse to combine. Add the rest of the ingredients and blend to combine – the crust looks dry, but it presses into the pan well, so don’t add more liquid! Press the blended crust into a 9-inch tart pan and bake at 350 degrees for 12 minutes until the edges are golden brown. Place the crust in the freezer to speed up the cooling off process (Or you can make the crust ahead of time). 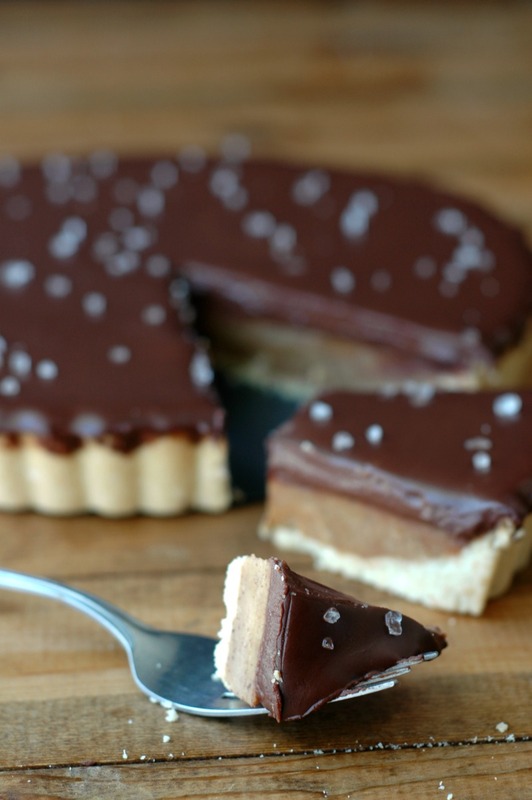 While the crust is cooling off, you can make the nut butter layer. Put the nut butter layer ingredients into a small sauce pan and warm through over medium heat until everything is melted together and smooth. 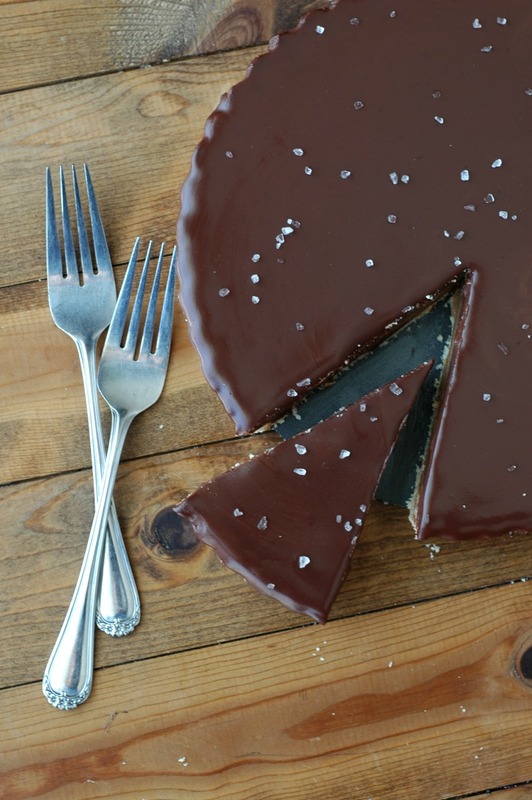 When the crust is fully cooled off, you can pour this nut butter layer into the crust. Put the tart pan back into the freezer for 1 hour to set the nut butter later. Once the nut butter layer is set, make the chocolate layer. Bring the coconut milk to a simmer in a small sauce pan, turn the heat off, and add the chocolate chips. Let the chocolate sit in the hot milk for one minute, and then whisk it in until smooth. 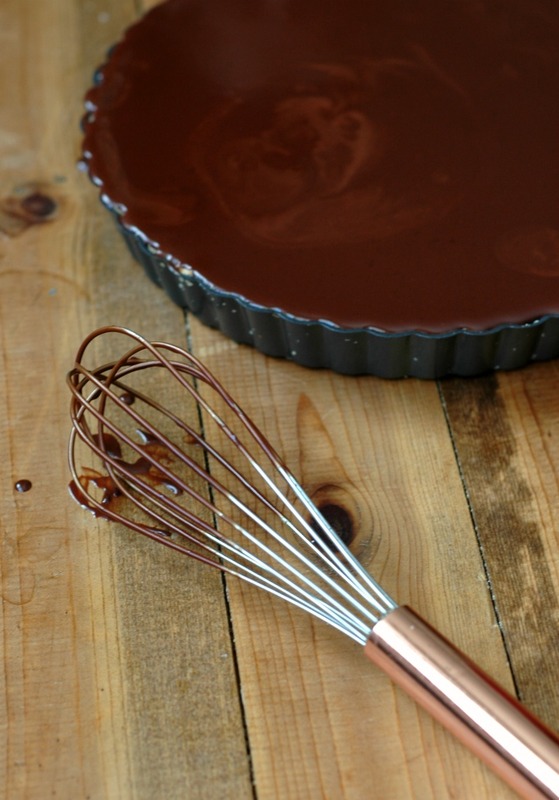 Pour the melted chocolate over the nut butter layer in the tart pan, and place the tart pan back into the freezer to fully set. 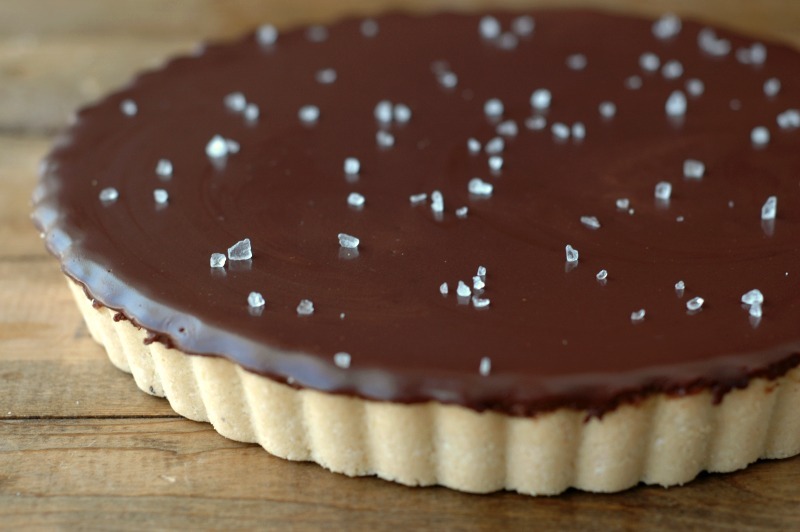 Garnish your chocolate nut butter tart with flaked sea salt if you desire. You can store your tart in the fridge. It cuts well at room temp, fridge temp, and frozen, so you can serve it at whatever temperature you prefer. Paleo Mini Banana Muffins :: Gluten Free, Grain Free, Dairy Free, Nut Free, Kid Friendly & Easy Prep! Real Food Mac N Cheese :: Compare to Kraft Mac N Cheese In Convenience & Kid Friendly Taste! My goodness this looks amazing Renee!!! You know how I love chocolate and healthier treats like this, I’ve got all the heart eyes over this one. I bet your family enjoyed every bite. Absolutely stunning, Renee!! 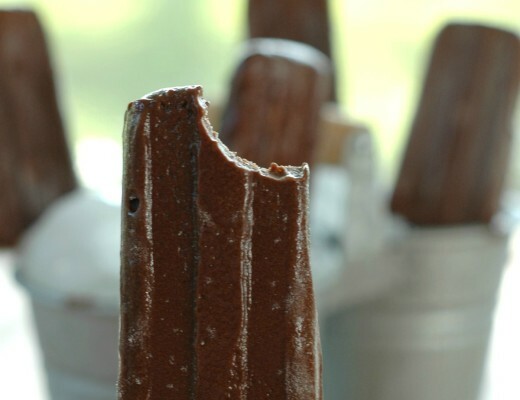 I love that top layer, the sea salt on top…and what you said about winter! Lovely. BEAUTIFUL! 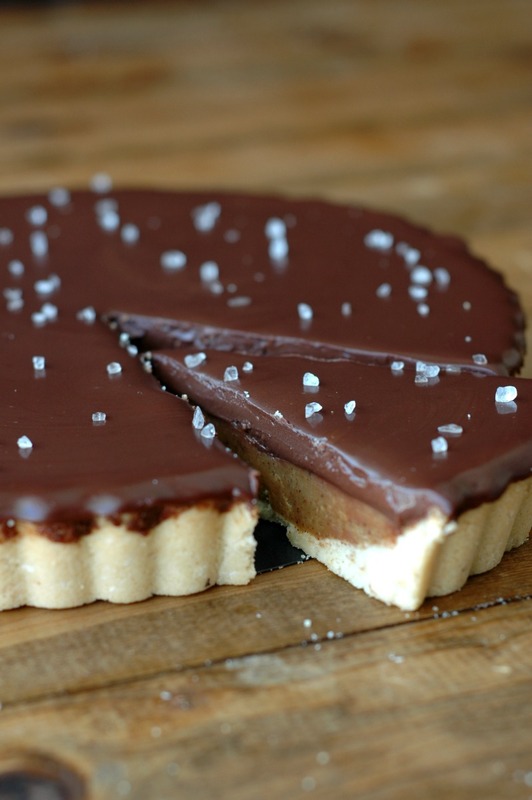 You know I’m over the moon about this tart, especially because of that chunky salt on top! Wow. I cannot wait to make this! Absolutely gorgeous! Loving the layers too! This looks STUNNING! 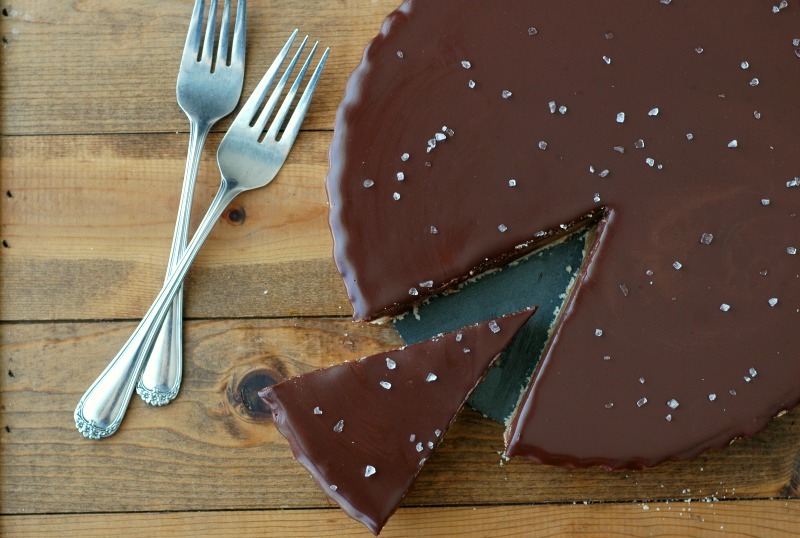 That salt on top, that shiny chocolate, and that nut butter filling… YUM TO EVERY SINGLE THING ABOUT THIS!!! This looks amazing! It’s like Reese’s pieces in tart form and I can always say yes to that. Gorgeous tart. This would be such an impressive dessert to make. I totally need no convincing to try this tart STAT!! It looks so dreamy!! Nice work! I like your philosophy of not being too hard on ourselves in the winter! I, too, live in a cold climate (Ontario), so it makes perfect sense! And isn’t it wonderful that we can enjoy such a decadent dessert mad from real food! Such a beautiful looking dessert! Those layers are perfect and i love the flavors you have used! I wish I could make a pie as nice as yours! The sea salt crystals are such a nice touch! STUNNING. Just looking at these pictures makes me so hungry! 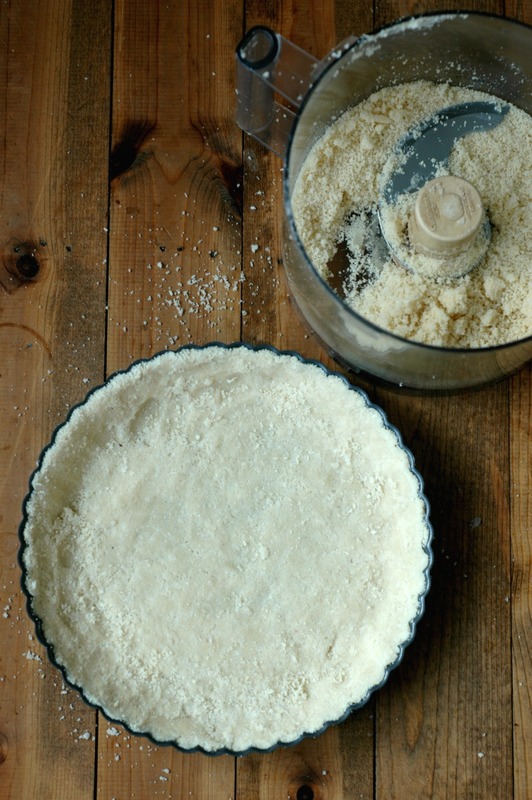 I like the sound of the crust for this pie and bet it would be delish with other fillings too! Oh my goodness! I might be having dreams about this gorgeous treat! 🙂 Love it! This is so divine! I am definitely making this one soon! Yuuuuuuuum this looks so good! Now I’m starving! 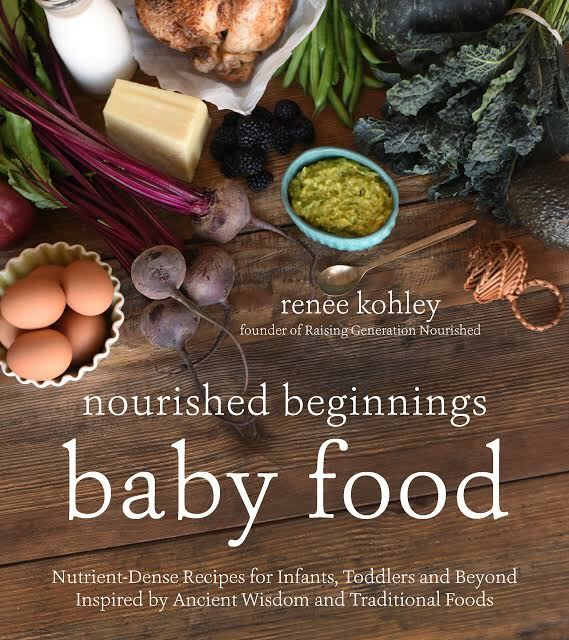 Thanks for the tutorial, Renee Kohley. This tart looks like absolute perfection. Lovely!! 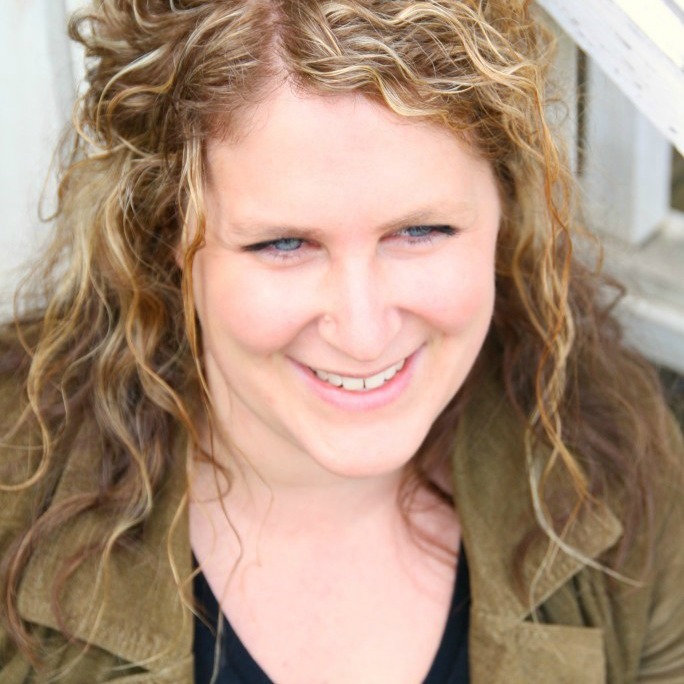 I love ‘giving yourself a little grace’ – it’s such a lovely way to think about our relationship with food throughout the seasons. I live in Toronto, so it’s similar weather and I think you have really hit home with me in that the winter is probably the time for cozy, nourishing food that fills the soul and the belly. That sea salt on top makes the entire look so finished. Brilliant recipe, thanks! Ohh my, that looks heavenly! Do you think I could use more palm shortening instead of the avocado oil? I can never say no to CHOCOLATE. SO YUM ! This is nothing short of amazing, so decadent and beautiful, and that sprinkle of sea salt sounds perfect! Made it for hubby’s birthday – everyone loved it! Thanks so much for the amazing recipe! Love that Olga! Happy birthday to your husband! I just made this and it was amazing!! SO delicious and very easy to make! Thanks for the recipe!! This looks so decadent! I need this in my life ASAP. Ooo, this crust alone looks amazing. The filling also looks finger licking good!